Portable ﻿automatic car jump starters, or auto charging stations, are multi-function car jump starters with built-in rechargeable batteries which you can use to charge a car battery, start your engine. In addition, auto jump starters like the Powerall auto battery starter can even act as an emergency power source for your smart phones, tablets and laptops. It's also incredibly small at 16 oz- you can fit it in your glove box. Users describe using auto jump starters to start completely dead Passats, Audis, BMWs, and even dead-battery tractors! All you have to do with these units is connect it to the battery, leave it on for around 20 seconds, and then turn on the engine- all of this will be accomplished in under two minutes and users provided written feedback that it works every single time. Obviously, these are really handy emergency devices to keep in your car- saving you from long, cold walks and being late to the office. Let's take a look at five of the top selling auto jump starters on the market today and see how they compare. The lightweight, fit-in-your-pocket Arteck Car Jump Starter Auto Battery Charger is an affordable option that can support vehicles with up to 2.5 of gasoline. Its users are delighted that it is great at powering up their car’s dead battery, but also note that it can only jumpstart one’s car up to 20 times when fully charged. The Arteck Starter has the following features: built-in heavy-duty cables and clamps, external USB battery charger (8000mAh), and a strong flashlight. The LED lights can be used as a strobe light, flashlight, or an SOS signaling light. The Arteck Car Jumper for 12V vehicles is a mutli-purpose car jump starter with up to a 2-year warranty. Customers are also positive about the customer service and delivery. The user manual is also helpful, concise and direct about how to operate the product. An added bonus is that you can charge the Artech Auto Battery Charger via the USB connector. 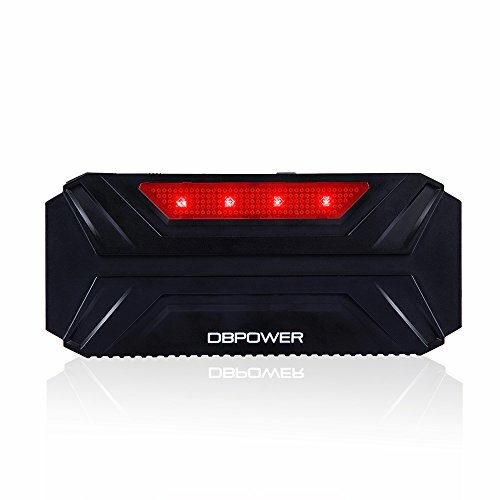 This powerful and effective DBPOWER 16500mAh Portable Car Jump Starter is an efficient option that supports car engines with 3 liters (for diesel) and 5 liters (for gasoline). Its users love that it is great at getting one’s car battery to run, but also note that it is more expensive than other cheap but reliable car battery jump starters. The DBPOWER 600A Peak Auto Battery charger has safety protection on its clamps and wires, a red flashlight can be used for signaling during emergencies, a portable charger (USB) and is pretty compact. This safety protection technology is a solid option if you are looking for a dependable DBPOWER Jumps Starter. Users like that it comes with an easy-to-understand manual. Every unit is backed by a 3-year warranty so while it may be a little heavy in the pocket, it is a bang for your buck if a problem ever problems arise with it. It ships with a DJS30 Jumps Starter, jumper cables, a 12-volt charger, a 12-volt car charger, and a manual. It is also compatible with 12-volt, 16-volt, and 19-volt outputs. People who bought a unit are overall satisfied with their purchase because it gets the work done, and efficiently. This portable, LCD-screened Kshioe Emergency Car Jump Starter is a convenient option that powers up vehicles with 500 amperes and 19 volts of electricity. Its users like that it is great at starting completely dead car batteries, but also note that the LED light doesn’t shine as bright as they’d like. The Kshioe Portable 12000mAh Car Jump Starter has safety protection on its cables and clamps protecting the user and the automobile from over-current, overload, over-voltage and over-charge dangers. Users like that it has a Smart IC chip to detect charging levels which is useful when charging smartphones. The LED light at the front has strobe modes and SOS that one can use in emergency situations. It may weigh 15 ounces but it fits in your pocket. It is rechargeable and it should have at least 25% charge to jump-start a car. One full charge can power up 4 medium-sized smartphones. Some buyers are misled about the peak power it can give because the manual says 480A rather than 500A. It is user-friendly because it has an LCD screen that shows the charge of the battery, the voltage used (12/16/19V) and temperature selected. Users do wish that it would come with a case, however. The 400 peak ampere, 12,000 mAh PowerAll Portable Car Jumps Starter is an effective option that has three functions. Its users like that it is great at charging car and electronic batteries, but also note that the lithium-ion battery inside quickly dies. It is great as a flashlight, as an electronic device charger, and a car battery jump starter. This jumps starter is a quality option if you are looking for an affordable car jump starter. Users write that it is great for emergencies, especially if they get stranded on highways. The light is strong enough for nighttime use and can run for up to 120 hours on a full charge. Many users are satisfied with their purchase and they recommend it to their family and friends because it is a convenient and cheap alternative to car road servicing. The PBJS12000R Rosso Car Jump Starter is recommended for use for 4-liter gas-powered vehicles, 3-liter diesel powered vehicles and 4-liter petrol powered vehicles. The complete kit ships with charging plugs for iPhones, Samsung, Sony Ericsson, LG, Nokia, Sony PSP, mini USB, and micro USB. However, the PowerAll PBJS120000 Car Starter sometimes doesn’t work because of its safety features and you might need to disconnect it for a few seconds before using it again. 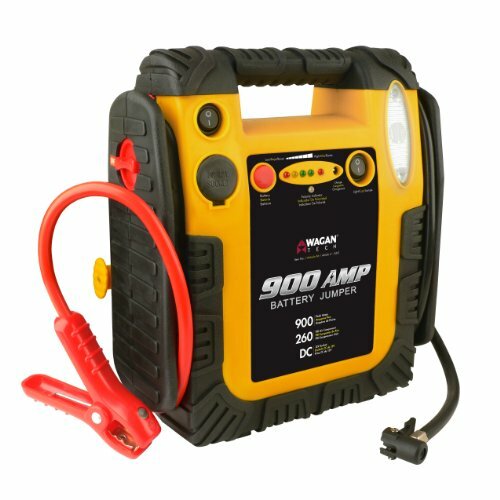 The unique, 900-ampere Wagan Battery Jumper is a good alternative option that comes with an air compressor. Its users like its ability to restarting their car batteries, but also note that it is a bit bulky for a portable jump starter. It has an air compressor to check your cars’ tires, as well. This innovative technology is a quick option if you are looking for a battery jumper with air compressor. It has also a lighting mechanism and can also charge certain electronics. These are some of the product features of the Wagan Car Jump Starter: LED lights, 260 PSI air compressor, jumpstarter (with cables) and battery voltmeter. It also has a 12-volt DC power outlet. Users are a bit disappointed with its air compressor because it runs slow. A few users also complain that it feels cheap and it is only good for a few uses as the battery doesn’t hold a charge that well. So not a top recommendation. A car battery constitutes the energy source of an automobile's system. It is frequently powered up by an alternator which is a part of the car that will turn mechanical engine energy into electrical energy. This energy interacts with the batteries electrolytes which are most frequently constituted of oxide plates that are immersed in a mixture of water and sulfuric acid. While your car is on and the battery is being used the sulfuric acid will interact with these plates of lead oxide to generate lead sulfate. The car battery is primarily intended to power the vehicle ignition and also give the vehicle energy for interior and exterior lighting systems. As well, for gasoline engines it will be used to provide fuel ignition energy. 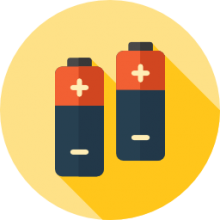 The most common type of car battery is the flooded type which in layman's terms is essentially comprised of a lead plate arrangement immersed plates and sulfuric acid contained in a reservoir. If you're looking to purchase a portable car jump starter- make sure you check out our comparison table at the top of this page. An auto battery car jump starter is a great emergency safety device to store in your glove compartment in case your battery dies or if you need to power up your cell phone in a pinch. These auto jump starters will include a built-in rechargeable battery, typically with the power to jumpstart even 12 V vehicles. Typically they will ship with a home charger, car charger, a smart jumper cable, some laptop connectors, a mobile charge cable and an English manual. Many models have another interesting feature- a red light that functions as an emergency roadside light to provide you assistance if you were doing maintenance on your passenger car when it is dark out. It's a good idea to frequently charge up your auto battery jump starters, keeping them prepared to service your car when it has gone dead. A smart way of staying on top of this is to create a calendar event in Google calendar, or your other email provider, to remind you to check in on the battery power every so often and charge it up to 100%. In any case, portable auto jump starter kits are really cool devices that can provide an invaluable emergency service if your car has died or your cell phone has gone dead and you needed to make an emergency call.